"They spend all day and all night together now." 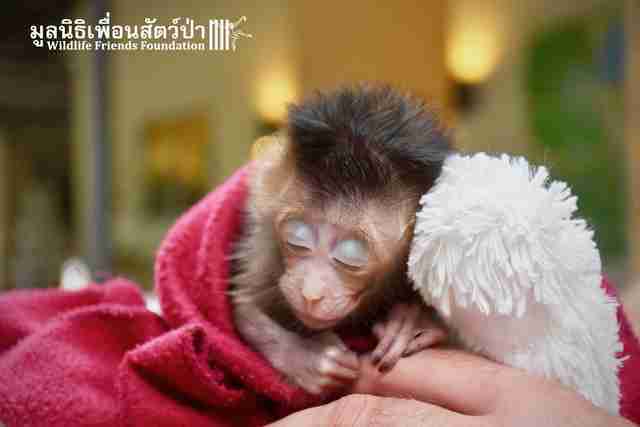 When people in Thailand rescued a tiny baby monkey, they quickly realized that she was absolutely desperate to be touched. They named the little long-tailed macaque Pearl and gave her a stuffed teddy bear — and she refused to let go. 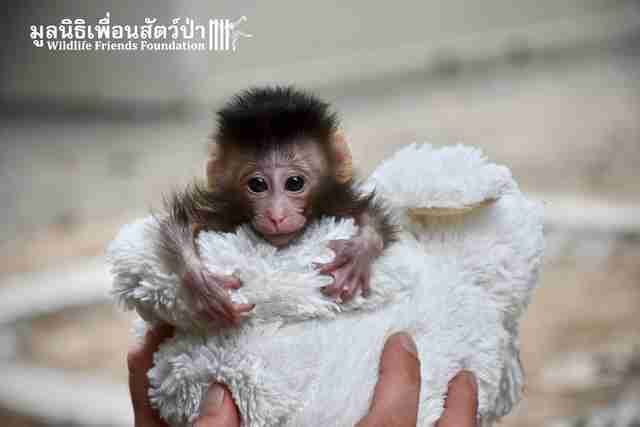 "Pearl still cries from the loss and lack of her mother’s care," Wildlife Friends Foundation Thailand (WFFT), the organization that rescued Pearl, wrote. "She is holding teddies like she should have done with her mom. She wants to be warm, to feel safe, loved." Pearl had been bought from a stall in a market where she was being sold as a pet after being stolen from her mom. Her owner kept her for 10 days before realizing that she was in over her head and had no idea how to care for a wild baby animal. She decided to do the right thing and turn Pearl over to the experts at WFFT. Even though Pearl was in such better hands, nothing would be quite like another monkey to comfort clingy little Pearl. But she didn't have to wait too long before she met someone just like her. In March, people traveling along a busy road spotted something heart-wrenching. A baby macaque, now named Boon Ma, was clinging to his mom's body on the side of the road after she'd been struck by a car and killed. 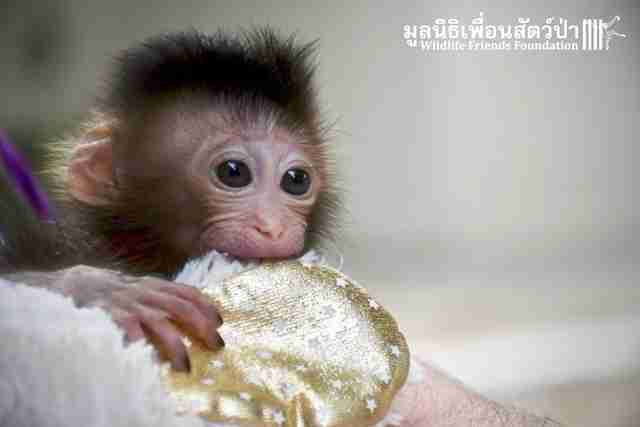 "The people that brought him in had kept him for two weeks after finding him clinging to his dead mother," WFFT wrote. 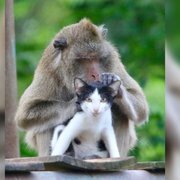 "We were told that they had attempted to introduce little Boon Ma to another adult female in the wild macaque troop but this did not work; after a day they had to recapture him for his own safety." Like Pearl, Boon Ma couldn't get enough love and comfort. He clung to his rescuers and refused to let go of them. And that's when rescuers realized that Pearl and Boon Ma, having gone through similar experiences at similar ages, were absolutely perfect for each other. So just the other day, Pearl and Boon Ma got to meet each other for the first time. The connection between Pearl and Boon Ma, when they were introduced on the trunk of a sapling, was almost instant. Now their rescuers call the couple "inseparable." 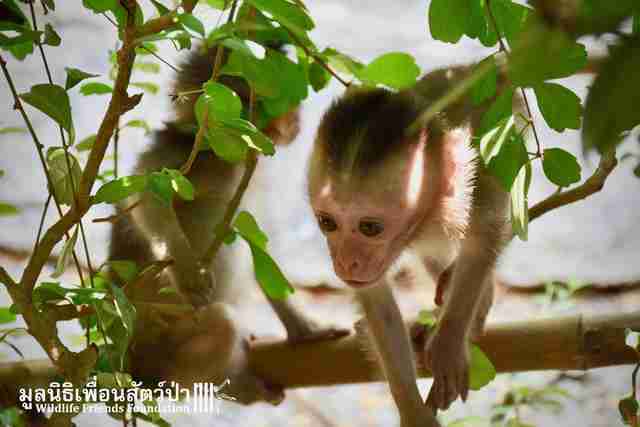 "Little Pearl ... has now become firm friends with even smaller Boon Ma," WFFT wrote. "Having each other will help erase the bad memories from their unfortunate start to life." Recently, the couple practiced climbing trees together. And it's clear that their shared natures will help remind them of what it's like to be a wild monkey as they grow up at the rescue center. "They spend all day and all night together now," WFFT wrote. They also both share an enthusiasm for stuffed teddy bears. But both of them are clinging less desperately to these objects — now that they have each other. To celebrate Pearl and Boon Ma's new friendship, you can make a donation to WFFT, which cares for so many orphaned and rescued animals like them.